I still remember the Hercules TV show that introduced me to the Greek mythology. I also remember watching Troy the movie, but not much else. I have not read many books nor play many games that feature the famous Greek gods and heroes. A few days ago, the team at Quelle Histoire and Historia contacted us about their recently released app: Odysseus for Kids. It features Odysseus, the King of Ithaca, and his adventure to Troy and beyond, in a storybook app with 15 beautifully-illustrated pages. Odysseus includes the famous story of the Trojan Horse used in the Trojan War. The story starts by introducing the royal family of Ithaca and telling how Odysseus got his name. Odysseus grew up and married Penelope, and soon, the story enters its first major turning point: saving Penelope’s cousin, Helen, from the Prince of Troy who kidnapped her. Accompanied by Achilles, Odysseus created the giant wooden Trojan Horse to sneak into the city of Troy and rescue Helen. After a successful 10-year war against the Trojans, Odysseus and his crew set sail for Ithaca. Unfortunately, they failed miserably to find their way back home. Instead, they got dragged along on a long and winding journey, encountering various Greek mythical gods and creatures. Along the way, Odysseus made Poseidon and Zeus angry, lost his entire crew, and was seduced by Calypso the Nymph to forget about his family in Ithaca. On the other end, Penelope was pressured to marry another man to replace the missing Odysseus. Can Odysseus find his way back home and prevent Penelope from marrying another man? Judging from the length of the story, Odysseus is not meant to be read by juniors on their own. Instead, a team of professional narrators will read the stories in 11 languages. The narration is so good that juniors ages 6+ would be able to understand most of the storyline. Within each chapter, juniors can play a mini game uniquely designed to fit the storyline. Upon completing the mini games, juniors will get a set of stickers containing portraits of the characters in the story. These portraits are neatly collected in the sticker album. 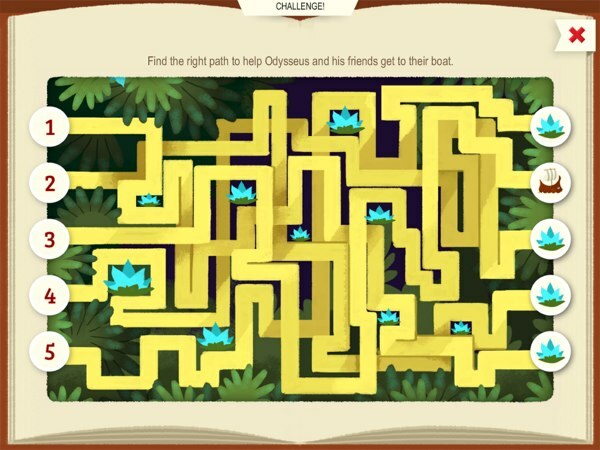 Odysseus for Kids has 15 mini games designed to fit the storyline. 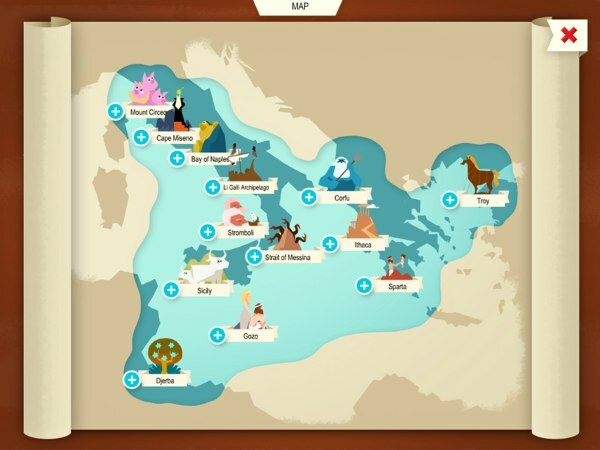 Because the adventure of Odysseus took place in many different places throughout the Mediterranean Sea, the app includes a map to help readers visualize where these mythical places may be located. A location is shown on the map as soon as readers unlock the associated chapter. I also enjoy playing the Greek-themed mini games included in each chapter. Many of the game mechanics are taken from popular games, such as jigsaw puzzles, spot-the-differences, mazes, and memory matching games. But, there are also unique game mechanics, such as identifying the Ithaca royal family members and replaying musical melodies as being played by the horrible bird-women called The Sirens. The app includes a map where the mythical locations mentioned in the storyline might be located. 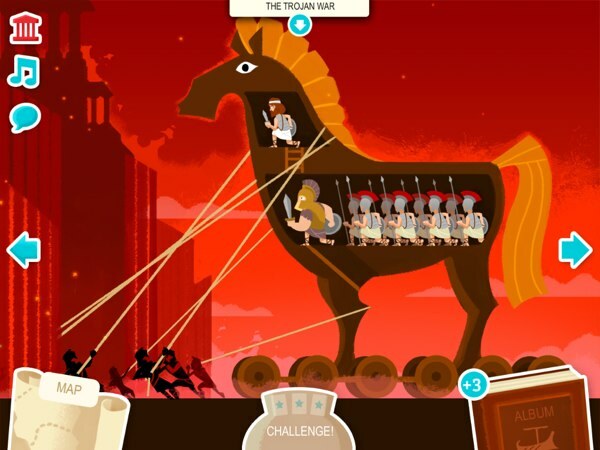 Odysseus for Kids is a great app to introduce the popular Greek mythology to juniors ages 6+. Juniors can follow the adventure of Odysseus, King of Ithaca, who encountered various gods and various mythical creatures on his way back from the Trojan War. With the inclusion of 15 themed games, the app brings an enjoyable and immersive reading experience. Odysseus For Kids is available for iPhone/iPad.